The fourteenth installment in this series is a mini CD by Peter Rehberg. 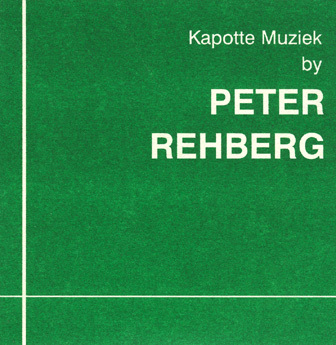 For his rework, Rehberg used the recordings of the very first Kapotte Muziek workshop (and concert) held in september 1997, as part of Staalplaat's 'Masterclass' event at the Korzo Theatre, in Den Haag. Rehberg moved away from the digital computer noise recently and for this work crafted together a beautiful soft but outspoken piece of music. The piece lasts 17:30. Derrière PITA, co-directeur du label autrichien Mego, se cache Peter Rehberg, habitué des collaborations musicales (Christian Fennesz, Jim O'Rourke, Tujiko Noriko) et de l'univers de la danse (DACM compagnie de danse grenobloise). Pour ce douzième volume de la série « Kapotte Mueziek », Peter délaisse les murs de sons et le feedback des réacteurs d'avions, pour nous plonger dans une abîme sans fond. Une chute de dix-sept minutes, entre deux eaux. Un mélange d'acier noir et froid et de basses vibrantes, de tôle broyée sous la pression et de respiration courte. Dans un précipité nous happant vers le fond, on s'enfonce sans moyen de résister. Mais au terme de la chute, Peter nous promet la lumière. Faut il lui faire confiance ? This is a reworking of the first Kapotte Muziek workshop (and live concert) held in September 1997. Originally it was the Frans de Waard studio project, based on the manipulation of sound 'scraps', shared then with other artists and become a Korm Plastics point of reference. Rehberg, aka Pita, is well known either as an electronic music author and dj, collaborating with such musicians as Christian Fennesz and Jim O'Rourke. His style indeed is less 'worldly' than his biography. It's minimal, sober and extremely elegant, meekly industrial and at the same time sensitive. These recordings won't change the course of this history, but they are significantly worth as a little but precious contribution made out of concrete sounds plus metallic and unmistakable frequencies.